One must have for any dog-owner is a dog bed, and you’re in luck if you have the simple tools I mentioned above. You can make your own dog bed without doing complex woodworking. 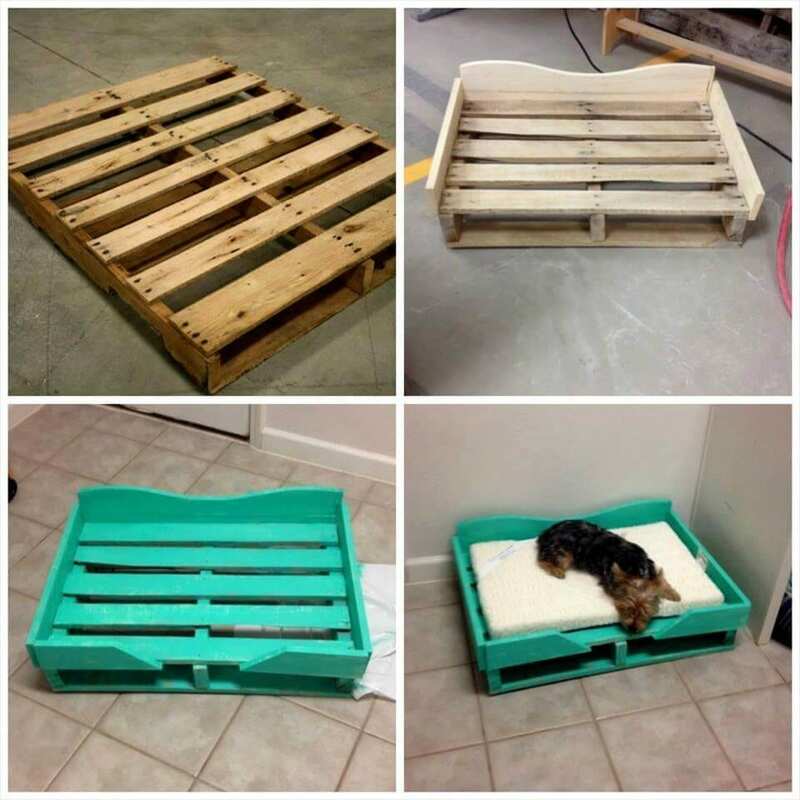 Fortunately, there are great beginner DIY Pallet Dog Bed Plans that you can do with just basic woodworking knowledge and a few hours. I can guarantee that you can finish these projects in a weekend. Some woodworking beginners start with a workbench, a fancy sander, a circular saw, some hand-tools and quality grade wood. But you would not have to start with such fancy tools. Instead, you can start with common woodworking hand tools like hammers, a wood saw a simple sander and wood scraps or a wooden pallet. Dog beds can get a little pricey. Luckily DIY Dog Beds are easy to make. 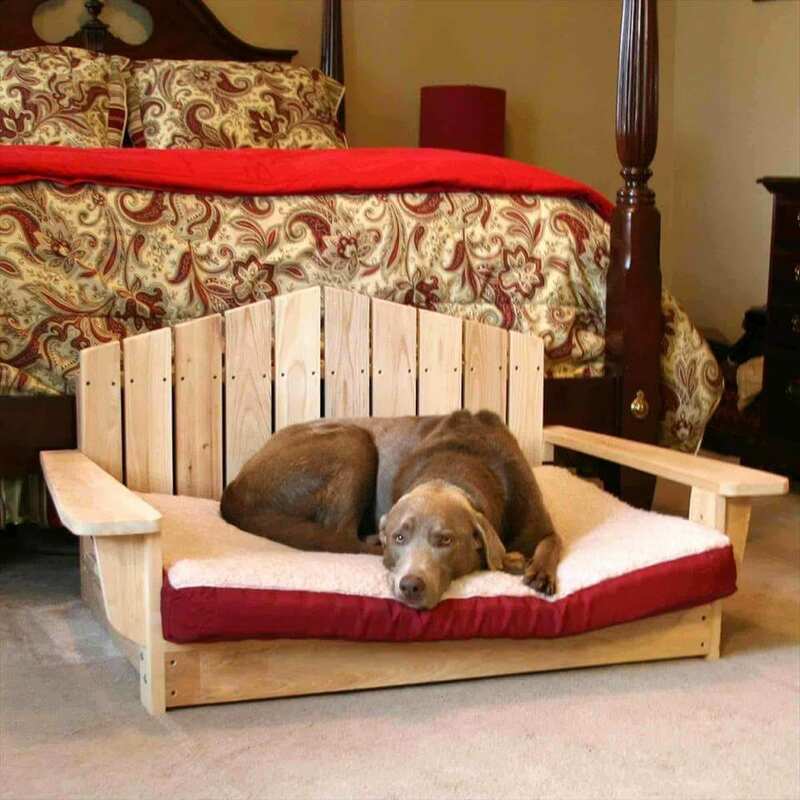 Upcycling wooden pallets can help you save money and create a dog bed that your dog will personally love. 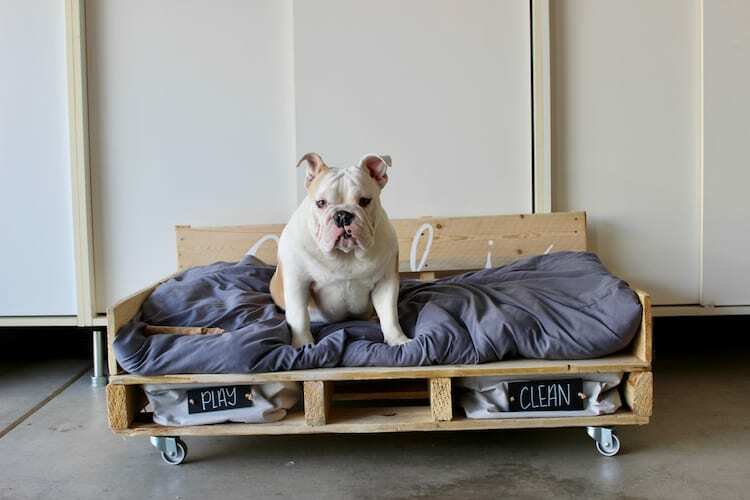 This DIY Pallet Dog Bed is especially cost cutting since it’s a twin bed for your dogs! 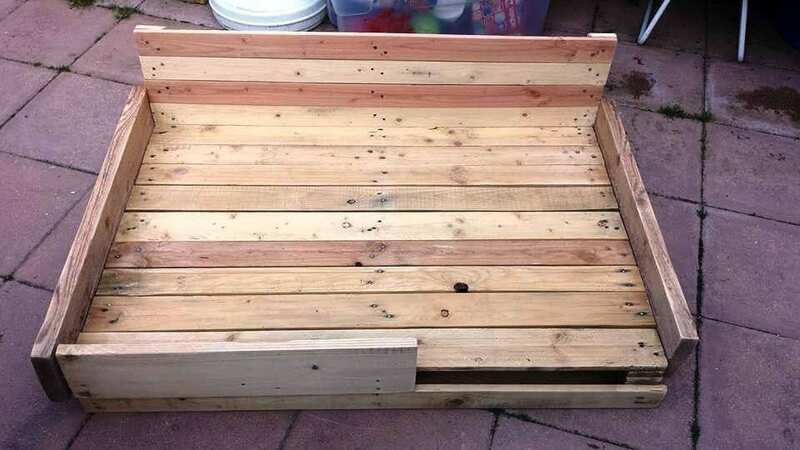 This Home Depot blog of your very own DIY Pallet Dog Bed is a must to be checked out because of (a.) It is a very detailed, short and fun tutorial. And (b.) because you can even shop the materials and/or tools you’ll need right at the site. 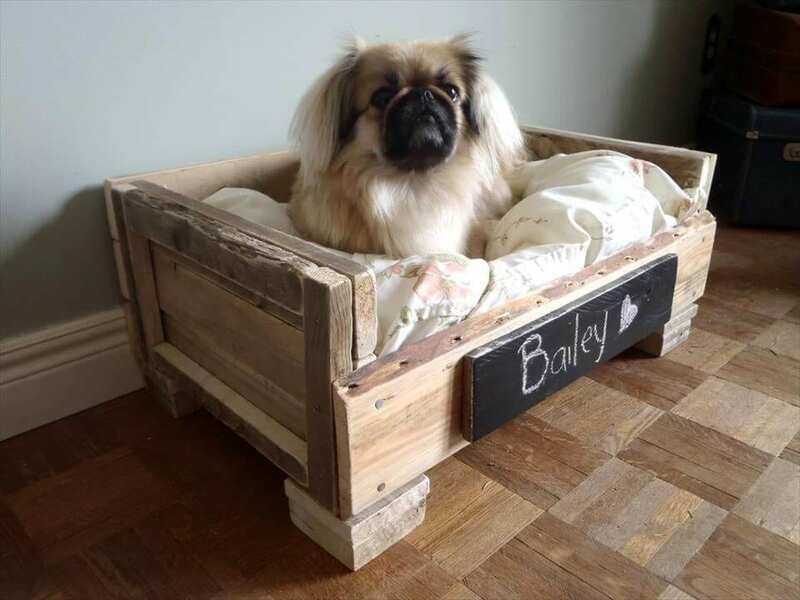 Now this standard dog bed made from a wooden pallet is suitable for absolute beginners. 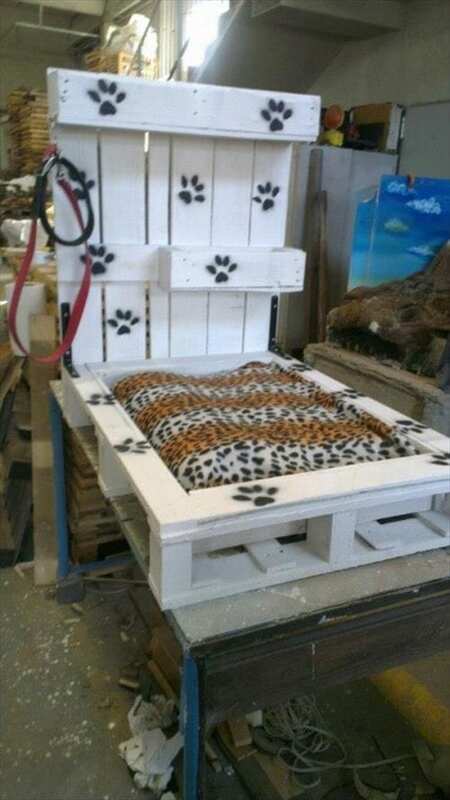 You would only need a few hours to a day to finish making this dog bed from its wooden pallet and wood scraps origin. If you have your key tools: i.e. your saw, your sander, and your hammer and nails then you can start on this project as soon as now. 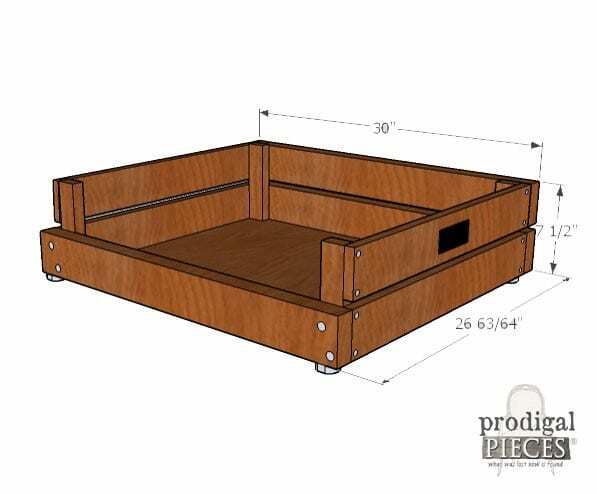 If you’re feeling a little fancier, you can totally use this dog bed plan complete with a back frame as a headboard for your dog. The key skills you’ll need is basic carpentry and this readily available plan and you can get going with your very own DIY dog bed. Sometimes, we want our beds raised a little higher than the ground and wanting the same for our dogs is very reasonable, fortunately, this DIY dog bed plan is easy to follow and requires just a wooden pallet and a plane of regular wood. This double bed is one of my favorites. Because having one dog isn’t just enough. 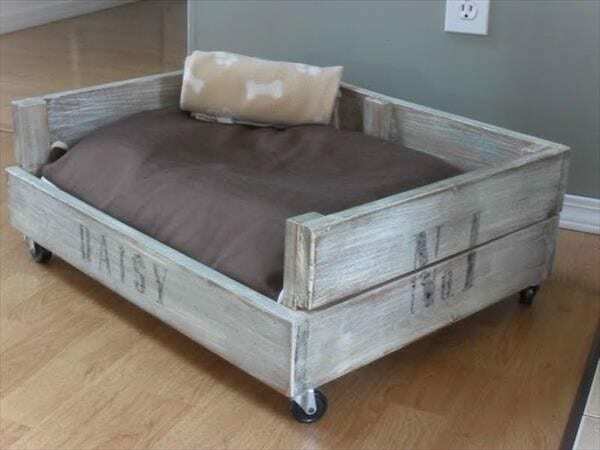 But honestly, this cute DIY pallet dog bed project is totally worth it. Depending on the size, you would need one to two wooden pallets to create this one. Complete with a plant so that your dog can go up to the upper bed. Painting your DIY Bed is a really good way of making it look more elegant and expensive too. In this YouTube video by Living to DIY with Rachel Metz, she partnered up with Home Depot to create this Pallet Dog Bed, but that doesn’t mean that you would need to partner up with Home Depot too. 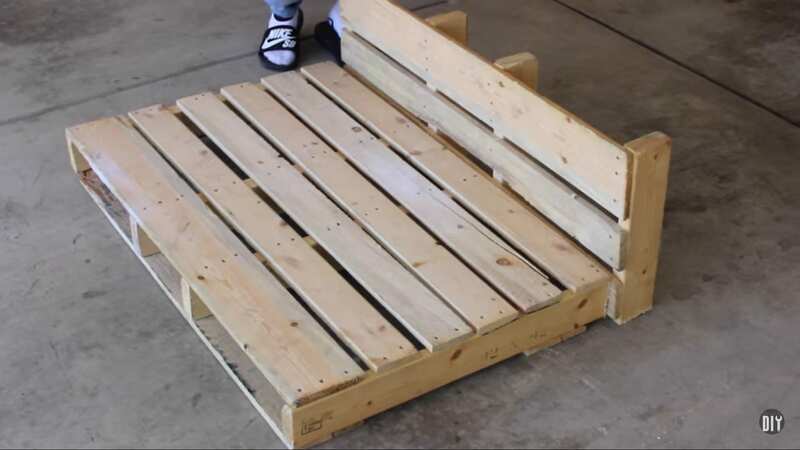 This short and easy to follow instructional video will tell you exactly what materials you need to use, the steps you’ll need to follow and then viola, you have made your very own home Depot inspired DIY Pallet Dog Bed. In this YouTube tutorial, Andrew Murray walks us through a complete DIY Pallet Dog Bed plan from scratch. Amazingly, this seven-minute video is a detailed walkthrough of the DIY. You don’t have to be intimidated by the tools that he used in the video, it has been guaranteed that you can follow this DIY tutorial with minimal skills and tools in woodworking. 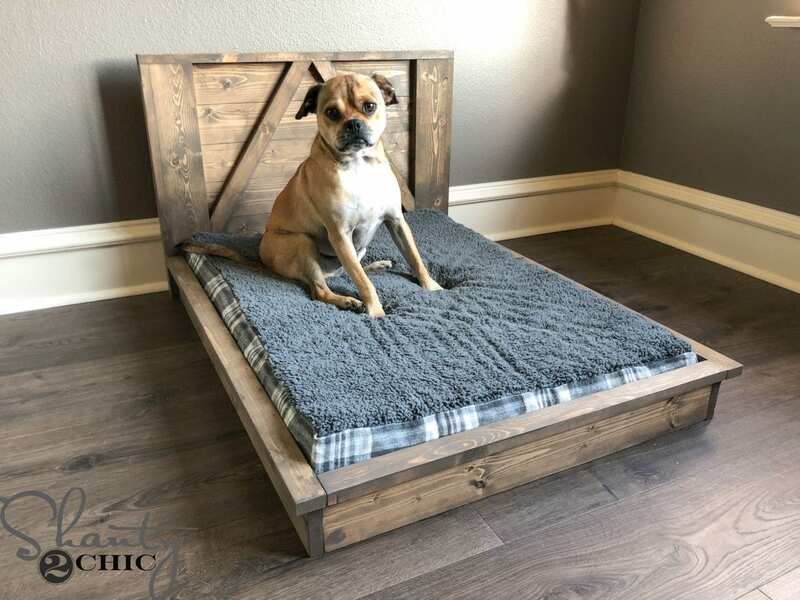 This cute and practical handmade Pallet Dog Bed is definitely for sale at this website, but that doesn’t mean you can’t totally plan to DIY this. Given the measurements and your beginner’s woodworking skills, you can save up on buying your pet’s bed and instead make it yourself. 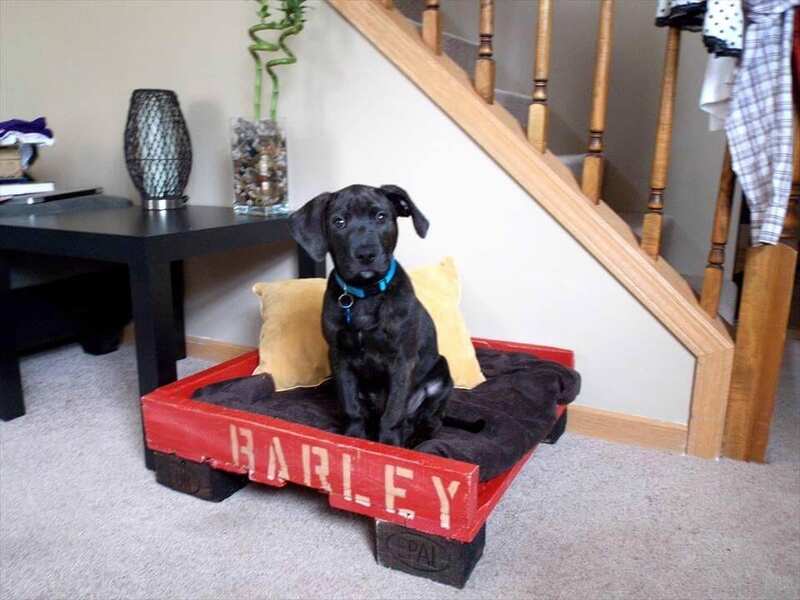 This repurposed DIY Pallet Dog Bed is one of a kind indeed. This bed really has no frame in its plan, instead, it is an open dog bed that allows space for your bigger dogs. This upcycled wooden pallet is proof that recycled things can look pretty and cozy. 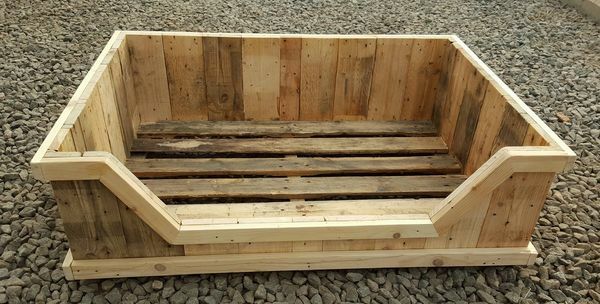 This DIY Pallet Dog Bed is a cozy outside dog bed and truly shows just how much difference a little woodworking can make. You can choose to make it look like a sofa or a chair and add armrest with just a few more wood pieces. Now, this simple and cheap tutorial is so simple that it does not need much of your woodworking skill. This video shows you exactly what you would want to see if you’re tight on time when making your DIY pallet dog bed. Don’t change anything. No need to add frames, as you saw in the other plans, it is not necessary to be comfortable or for it to look pretty. No need to dismantle and rearrange the wooden pallet too. You can simply varnish or coat your wooden pallet (not even necessary) and top it with a cushion. This staircase double dog bed is seriously gorgeous and cute. 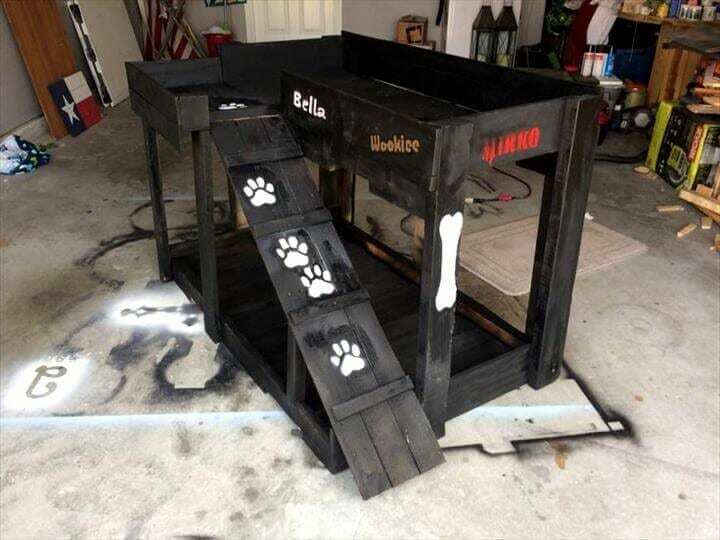 This top bunk can be accessed by your dog via this cute little staircase made of regular wood (you can recycle wood scraps for it). This is definitely making two beds with one DIY. This farmhouse dog bed tutorial technically uses good regular wood, but I can say that you can swap out that wood in the plan and use an old wooden pallet instead and it would still look as beautiful and the same. If you want something fancier or mobile for your dog, then this bed is the perfect DIY for you. 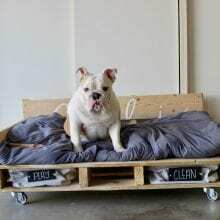 Putting wheels on your DIY Pallet Dog Bed allows for more mobility and easy transport of the bed. This dog bed on wheels is one of the many you can choose from on this list. This Pet Bed building plan is more or less general about the wood you can use for making your DIY Dog Bed, but the measurements and dimension of the building plan is just perfect for a wooden pallet, so you can swap out the expensive wood for a recycled wooden pallet. I’m sure your dog will love it all the same! This list may go on for a while if I had to list every possible plan for your dog’s very own dog bed. 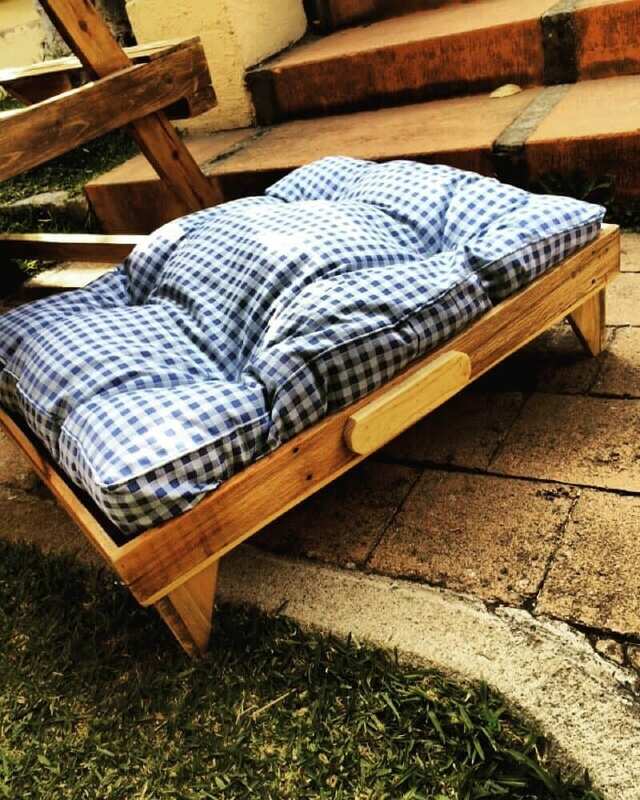 Now that you have selected your DIY Pallet Dog Bed plan, you’ll only need a handful of basic tools, beginner’s level of woodworking skills and your very own wooden pallet (better if you recycle ones that have been stuck in your garage for a while now). Making your pet’s bed by yourself can save yourself a lot of money than just buying expensive pre-made ones over the internet. Dog bed prices can range from twenty-five dollars to a hundred. It can be made of soft cotton materials, can design to be low or elevated. Woodworking your pallets up to make it into something more decorative or useful doesn’t always have to be stressful. You can choose to do it as simple and cheap as a standard wooden pallet can be, or you can redesign and upcycle your wooden pallet to make it look more elegant and pricey. You can choose to add frames or stands, or armrests or even wheels. Doing-it-yourself is a very practical way of designing, planning and creating something useful and something that you and your dog will love without spending too much.